This stunning contemporary tree is printed using fine silver foil embellished with holographic silver foil. 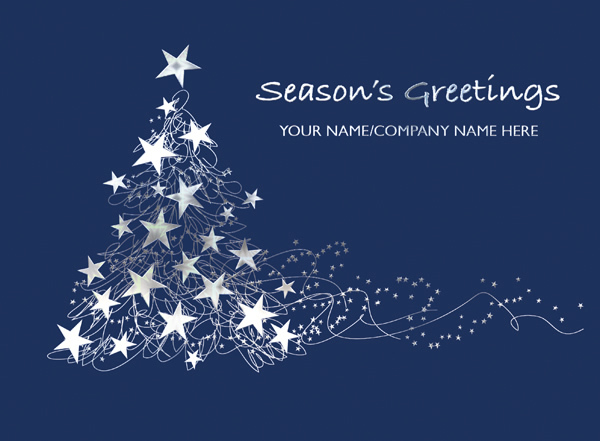 Add your choice of greeting and your family name or company name, printed in silver foil, to the top right of the design, where shown. You may also change the caption 'Season's Greetings' on this card. This design can also be purchased without the front personalisation - please see design ref: 3G127, if you prefer this option. By purchasing the Dazzling Star Tree - Front Personalised Christmas card 10p for each card you purchase will be Donated to the Charity of your choice from the Charities listed below.